When I was a kid – languishing in antiseptic, monotonous, monocultural, suburban Lilburn, GA – I wanted my life to be more real, even if that meant I went a little crazy. Books like CATCH-22 or ONE FLEW OVER THE CUCKOO'S NEST convinced me that the only way out of modern anomie was to basically become utterly and completely bonkers. And I wasn't. I was disappointingly sane. Still, literature does give you a bit of a crazy contact high; you can play along with neurosis and hallucination, obsession and disassociation. Sometimes mental illness is linked to an artistic escape from the stultifying boundaries of conformity (Poe) or to the perception of a better cooler reality then the humdrum one we are forced to schlump along in (DON QUIXOTE). 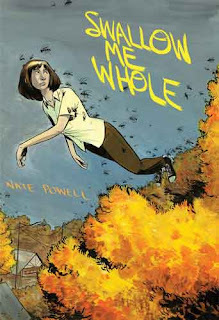 Nate Powell's SWALLOW ME WHOLE plays with that same tension inherent in creative depiction of mental illness. His graphic novel follows twins Ruth and Perry as they navigate not only the difficulties of adolescence but also the challenges of mental illness. Perry periodically hallucinates; his pencil sprouts a tiny wizard creature who sends him on missions that seem to always result in getting beat up (although sometimes he gets a girlfriend for his troubles). But at least he knows he's seeing things. Ruth suffers from a strange form of Obsessive Compulsive Disorder, which involves collecting and labeling an ever larger glass jar collection of insects (Linneaus disease?). The early parts of the graphic novel weave together foreboding and innuendo. Is grandma's dementia a byproduct or result of her creative output? Is she a cautionary tale or an illustration of the road less traveled? Is mom's growing deafness real or convenient? Are Perry's hallucinations nudges from a restless id, driving Perry to experience the world and break out of his morose worldview? Where's dad? Even Ruth's illness and the suffering that it causes her helps her land a gig as an intern at a local natural history museum. Unfortunately, her OCD devolves into hallucination and a giant stuffed frog begins talking to her. One of the strengths of the graphic novel is that it's able to capture a skewed reality in such a way that it's easy to suspend disbelief. Perhaps, because readers are primed to expect people to fly or leap tall building or shoot laser beams from their eyes, they can be more easily induced to accept characters lifted bodily over their lawns by Beelzebub's swarms of insects. The same imagery in a move would be too surreal for us to care about the characters and in a novel too difficult to accept. Graphic novels have shown how well they can present memoirs that use hallucinatory art to illustrate symbolic meaning (EPILEPSY or MAUS or even FUN HOME), but in a fictional story the use of these techniques are able to separate a bit from the indulgence of an author's life and reach for the larger significance of literature. The images invite us to consider the ambiguity of the charaters' experiences. Part of the appeal of SWALLOW ME WHOLE is the gorgeous allure of the art. Finding a sweet spot between the stark drama of BLACK HOLE and the swirly romanticism of BLANKETS, the graphic novel manages to both scare and bewitch. For instance, when Ruthie is haunted by the swarms of bugs that collect on her lawn, Powell scrawls huge SHKAAKs across the page in thick slanty script. Still, there is a promise of transcendence in those bugs; they lift her bodily into the sky like a modern-day Mary or Remedios the Beauty – her face an untranslatable mix of exaltation and fear. Even the lettering twirls around the characters and wraps them in the words they use to make sense of what is happening to them. While graphic novels give students the opportunity to use visual cues to assist in their reading, there are a number of obstacles in using works like SWALLOW in the classroom. It would be hard to image a school having either the cash or the inclination to buy a full class set of such a personal, quirky book. Also, despite the fact that the book follows teenagers (and there's nothing more interesting to teenagers than teenagers), this is not a story that resolves neatly or has easy answers. Students have to be willing to accept surrealistic art and the lack of closure. However, I think there are some great possibilities for this book to be in a teacher's library; I could image it calling to just the right student at just the right time. There is even a possibility in using it to encourage students to create short illustrations of scenes from their own lives, complete with the surrealistic imagery that suggests the symbolic importance of what is happening. Highly Recommended for High School Students. There are a few cautions in terms of profanity and teenage situation, but they are relatively mild.